I have been interested in a woman that I know from work that is much younger than me and I have been trying to pursue her. I am a 55 year old divorced man (no children) who at this time would really like a serious relationship leading to get married a family. I am in good shape and don’t look my age. The woman that I am crazy about is 37 and I feel we have a great connection. I could see a future for us. We are not in the same department so we could date. Recently I expressed an interest in dating her and she told me that she was not interested in a relationship with me. Should I persist? I have heard that women do change their minds sometimes if the guys stands firm. What do you recommend for a nice guy who is marriage minded? 1. Is she truly open and ready for a serious relationship? Is she actively dating? Or is she coming off a bad relationship and getting her equilibrium back? 2. Did she give you a reason for not wanting to date you? Could it be she has a rule not to date at work? You may want to probe further. Just brace yourself she may tell you she is not attracted to you in a romantic way. 3. Or perhaps she is emotionally closed and has trust issues with men. It may not be you. Or she has other goals in her life and does not want to get into a long term serious relationship or even wants marriage and a family. I am learning of more women are falling into this category. 4. Or perhaps this is a timing issue and in time she will see you as a worthy mate. Can you wait and if so, for how long? Is there a way to continue to show her your interest in her with the hope that she may come around and eventually be open to a serious relationship with you? I truly doubt this. As I see it this is a very low probability strategy. I have to ask you why you want to go after someone who is unavailable and does not seem receptive to your romantic interest. Don’t you want to be with someone who is thrilled to have you in her life? Someone who is open and ready for a relationship? In rare instances have I seen this kind of situation turnaround. I recommend that you find a way to come to terms with this rejection and, if need be, move on by working with a coach or a therapist. I suggest you look for a woman who can appreciate you and also wants the family life you seek. There are many women in their late 30’s and early 40’s who dream about finding a serious relationship with a great guy that leads to marriage and having a family. If you are truly as youthful as you say, then you will not have any trouble meeting eligible women. You just have to be open to getting out there to meet women for dating. You can do this by creating a targeted online dating, or by asking people who you trust to introduce you or by using a dating–matchmaking service to introduce you to such a marriage minded woman. In your 50’s you can still have the loving married life and family if you are willing to stay focused on this goal and stop pining away for an unavailable woman. PS. 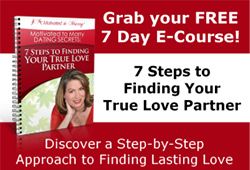 If you want to learn how to GET CLEAR about who would be a good partner for you, FOCUS on where to meet such a person who wants a serious relationship and also shares your core relationship values and then SOLIDIFY that relationship once you do connect with the one, go to www.MotivatedtoMarryDatingSecrets.com and get on track to finding true love sooner than later. You will also be included and get support from a community of marriage minded individuals.